In February I got hit by a bad bug, a flu that knocked my on the floor for a week. Being sick for a few days had sapped a lot of energy and it was driving me nuts. The forecast had called for a sunny and warmer weekend, so I told myself that I had to make an attempt to get out of the house and get some fresh air. That Saturday did indeed turn out to be a sunny and warmer one, so I hopped in my Volkswagen Rabbit and decided to go for a drive South towards Alma. 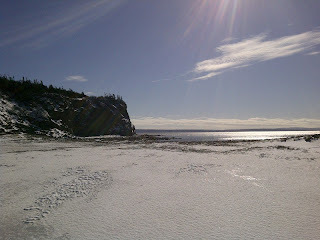 I drove down Riverside-Albert and decided to head towards Cape Enrage. The roads were somewhat in fair conditions when I reached the Cape Enrage road. It was plowed to a certain section and then abruptly stops after the 90 degree bend close to Waterside Beach where I had spent quite some time doing stratigraphy. 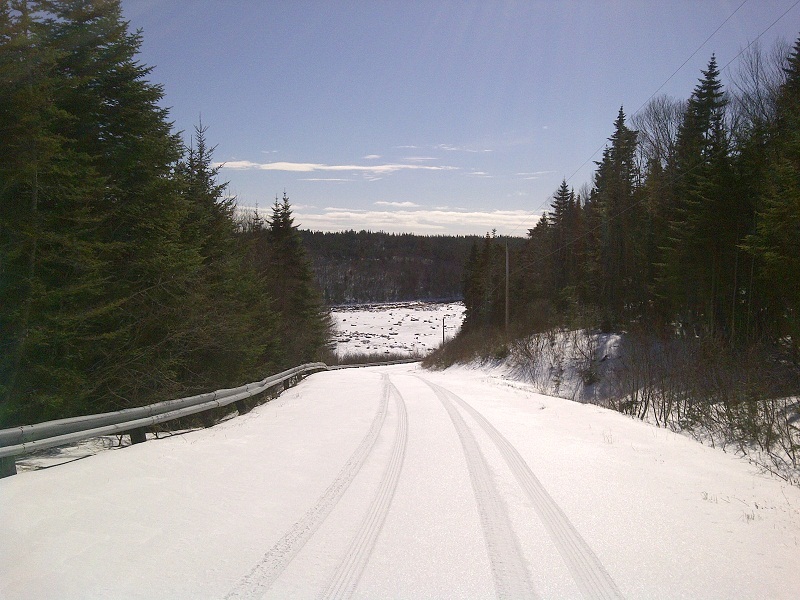 The road were snow covered but barely an inch in thickness, BUT what could have made my trip short was the steep hill I had to drive up to get to my destination. 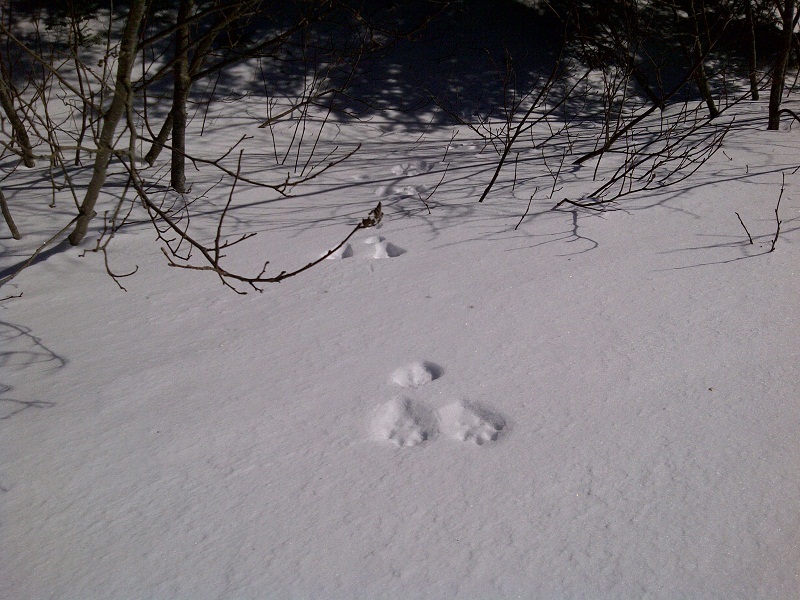 There was a whole whack of tracks of many failed attempts to get up the hill, but I was confident my bunny was able to do it. 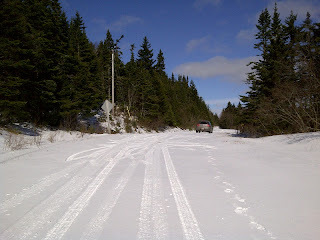 After a few kicks and the car traction kicking in a few times, I was able to make it to the top! I drove a few hundred meters then turned around and chose a parking spot. I was proud that my car made it to the top, but I didn't want to risk driving down the hill on the other side where the snow was thicker and more packed. There was a single set of tire tracks from what looked like a 4x4 vehicle, with spots along the road where it apparently struggled to make it up. From the car it took me about 30 minutes to get to the beach. The only sound I heard was the wind, the snapping of branches, and the crunching of snow with each step I took. All around me were fresh animals tracks of all sorts: foxes, mice, rabbits, birds, all criss-crossing the road. By the time I reached the beach, I was sweating and feeling it. The Sun was beating on me and I was still not feeling 100%, but I was glad to have made it this far. I walked down the beach and towards the East cliff section. I strolled about at the foot of the cliff to see if there was anything that had come loose but surprisingly, nothing. Nothing had really changed since last fall, and that was a little disappointing. But the matter of fact is, I was happy to have come here and recharge my batteries. I had never seen this area under snow and it was very nice, very serene, with only the waves and the wind for sound. I'll be back in the area soon but on the other side West of here to find any changes in the local topography. Who knows, there might be more trackways waiting to be found. Pretty area, and I'm glad to see it in it's winter glory. Glad you are now feeling better. Thanks for the field trip.